Raised in 1803 as Skinner’s Horse by James Skinner (Sikander Sahib) as an irregular cavalry regiment in the service of the East India Company, the regiment became 1st Bengal Lancers and the 3rd Skinner's Horse. It remains the senior cavalry regiment of the Armoured Corps of the Indian Army. The regiment was involved in a number of the campaigns on the Asian sub-continent, notably the First Afghan War 1839 to 1842 between Great Britain and Russia. The Second Afghan War 1878 to 1880 between Britain and Afghanistan. The First Sikh War 1845 and 1846 and the Second Sikh War 1848 and 1849. resulted in the subjugation of the Sikh kingdom, and the annexation of the Punjab which became the North-West Frontier Province. The regiment also saw servive during the Boxer Rebellion and at the Battle of Peking. This is the beginning of an occasional new series that will focus on the soldiers of the British Empire during its zenith between 1880 and the beginning of the Fist World War. 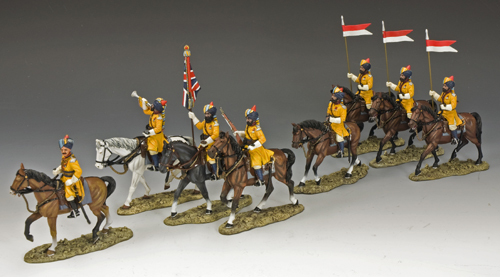 It will portray Infantry, Cavalry and, occasionally, Artillery as they would have appeared on parade (and in the field) at that time.